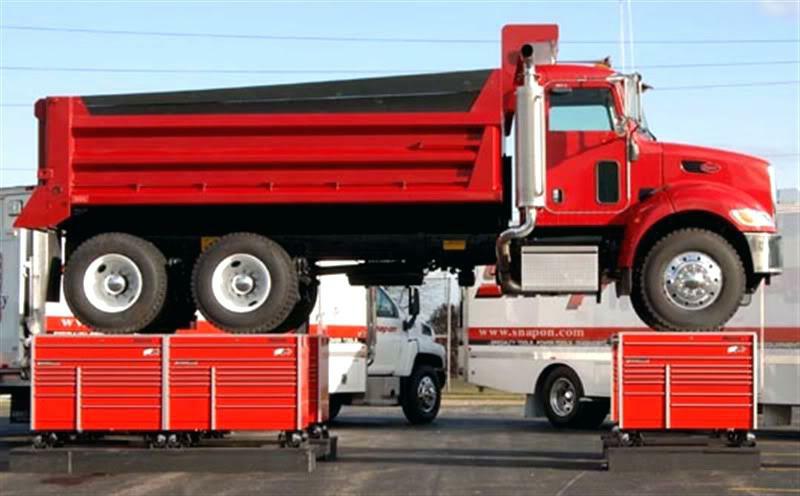 In a daring test of strength, Snap-on Tools Company placed a Peterbilt dump truck on six tool storage cabinets to demonstrate the durability of its storage units. The Snap-on® premium KRL extended cab system rolling units were outfitted with steel plates and wheel chocks to stabilize the weight of the Peterbilt dump truck, which was lifted on the cabinets with six heavy duty mobile lifts. The KRL storage cabinets are built with double-wall construction, which uses two full-sized layers of high-quality "Class 1" heavy- duty steel to provide ultimate strength, durability and finish. Heavy-duty ball bearing drawer slides help drawers open smoothly and interchange easily, and the Snap-on® Lock N' Roll® system prevents drawers from drifting open during unit transport and non- slip liners keep stored tools in place. They certainly are strong, they are built really well. But tool cabinets don't need to hold up weight, not like this, they just need to slide drawers open when you are looking to get a tool. So, lets not get crazy.